If there is one thing I have learned about myself over the past few years is I love creating an inviting space that is colorful and cozy. It's important to me that we not only have a comfortable space but put-together and chic. I've learned that there is a fine line between cozy and chic, but I think we are on our way to finding pieces or items that fit both categories. I used to have fake flowers sitting in a vase year-round. How boring! 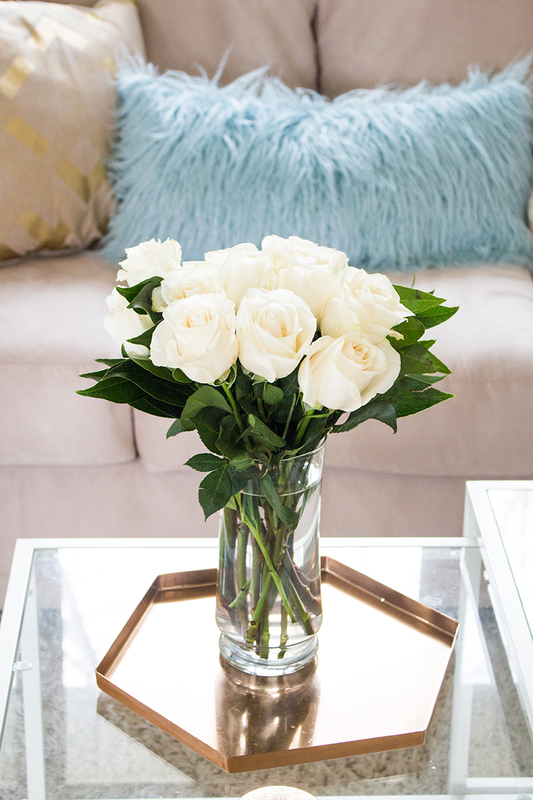 I go to the supermarket every weekend and pick up a fresh bouquet or two, there is nothing I love more than having fresh florals in the living room. Not only do they add a comforting element, but they are a great way to spruce up a dull space or add some color. 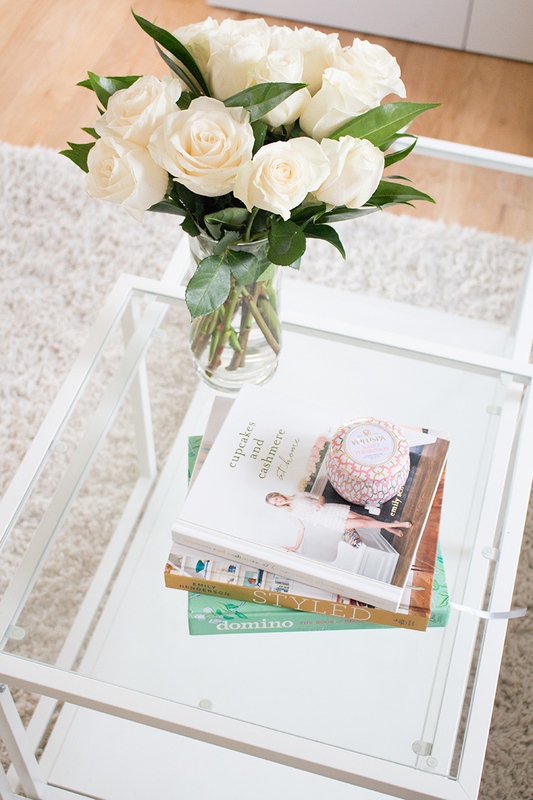 Adam and I love books, and I have grown quite fond of having coffee table books everywhere. A few of my favorites are always sitting out for our guests (and myself) to read. They also serve as instant inspiration...I am definitely the type who is easily inspired by my surroundings. I try to fill our living room with elements that make me want to write, create, and take photographs. When I am doing those things...I am most inspired! Chances are, if you walk into our living room, there will be a candle burning. I love having a fresh scent radiate through the house. We continually burn through candles, some of my favorites are Voluspa, Volcano, and this Target kind. Here is where I try to bring in some comfort along with decorative. I love pillows...a lot of pillows. I've always found great throw pillows at Target, and I like to purchase new ones from time to time to rotate them out. At first, Adam hated all the throw pillows but I think we have come to a mutual agreement that they make the couch more comfortable! For a long time, all we had was a couch. It was horrible whenever we had people come over and even when both Adam and I wanted our own place to sit. A few weeks ago we decided to purchase a chair. While Adam was all for a recliner...I wanted something that looked nice that was comfortable too. We agreed that this World Market chair was the best option, and what a difference it has made! (It's also Adam's favorite spot.) Not to mention, we got the chair 50% off...a total win in my book. I will definitely pay the right price for comfy...and chic! 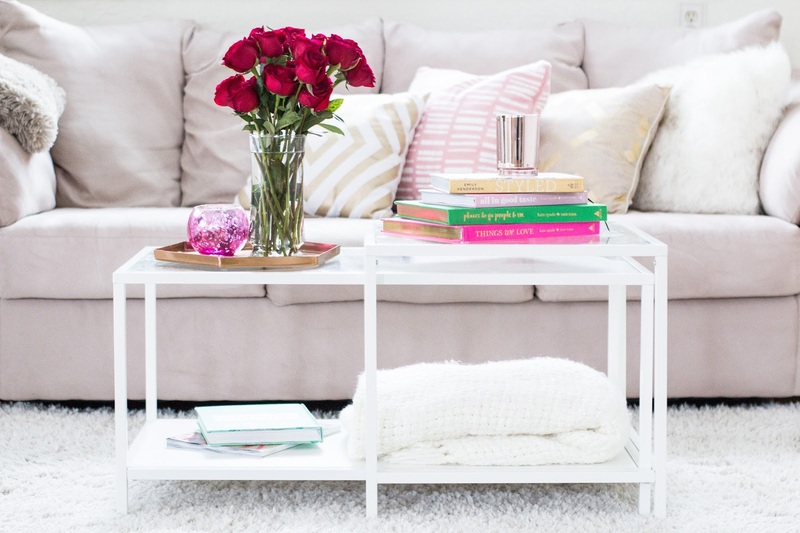 What are some of your living room must-haves to make the space more inviting and comfortable? !